Choosing a CEM or CMS platform is an important decision for any business. [A]Ⓡ offers a thorough and comprehensive CMS evaluation process to help business leaders choose the right CMS for their content and marketing needs. We also enjoy partner relationships with leading CMS providers, including Sitecore, Kentico and Ektron, to provide added support and expertise. The right CMS supports marketing, sales, recruiting, and other efforts, ensures the best customer experience, and skillfully manages cross-channel exposure, interactions, and transactions. 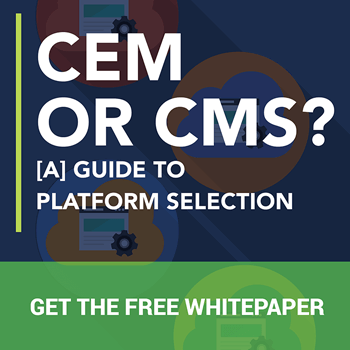 Download our Guide to CMS Platform Selection and learn how to choose the right CMS platform for your business, or contact [A] for help with selecting a CMS or running a comprehensive CMS comparison.